"Skogsbrandsutredningen: ”Sweden is not sufficiently equipped”"
"today was interior minister Mikael Damberg (S) received Skogsbrandsutredningens final report on this summer's massive forest fires. " "– Even if it was good in the summer, we must make the conclusion that Sweden is not sufficiently prepared for future forest fires, " says the investigator, Jan-Åke Björklund. " "Several studies were conducted after the major fire in Västmanland 2014. 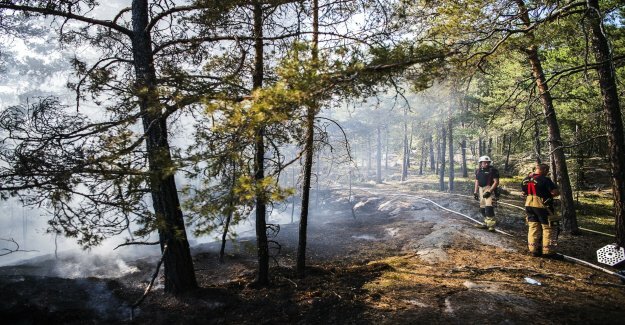 Skogsbrandsutredningen put forward a number of proposals for action, but when the fires hit this summer, had only four of the eight started. " "– Skogsbrandutredningen did not lead to anything. You just took it but did nothing in particular, it did not lead to any legislative proposal, Jan-Åke Björklund, previously told the daily News." "He led the räddningstjänstutredningen as the big skogsbrandsutredningen considered to be necessary and which, among other proposed requirements for better cooperation between the municipalities and the greater the opportunity to scale up and get better conditions." "He is also the one who led the new skogsbrandsutredningen which on Wednesday handed over its final report to Mikael Damberg. " "– the Government will give priority to the preparation of this issue. My intention is to send it on a referral even as early as next week, " says Damberg." "– No essential public services were knocked out, no people were seriously injured, but a firefighter died in a fallolycka in connection with a fire. For many individual forest owners, it was a disaster, and several hundred people had to be evacuated. Even if it was good in the summer, we must make the conclusion that Sweden is not sufficiently prepared for future forest fires, " says the investigator, Jan-Åke Björklund. " "the emergency services alone will not have to deal with this type of big events mean the investigator. In some places it worked well, while others less emergency services were heavily loaded. " "– The main shortcoming applies to the small municipalities that are not included in a system of constant readiness. Ljusdal has been seen as example of the difficulties for a small municipality. This little rescue did not have a chance to do it here, they had been inside a system, it had gone much better, " says Jan-Åke Björklund. " "the”State supervision to be tightened up”"
"He lists a number of proposals included in the final report. Changes in the law, which means Authority for civil contingencies agency shall be allowed to provide how the action programmes for the emergency services should look like, where each of the emergency services must describe how they will cope with crisis situations, by themselves or in collaboration with others, and that MSB shall get clearer mandate to allocate resources. " "another suggestion is to be able to hire other than the municipal operators in a larger extent than today. With today's rules, you need to have an agreement with the municipality in order to respond in a fire situation." "a Further proposal applies to all municipalities, the emergency services must be connected to a larger system that has constant preparedness. The investigator proposes also that the state's supervision of the emergency services to be tightened up." "”the main Thing is that the plan is”"
"– Implements state it here and the emergency services is being upgraded, we will have a much greater opportunity to deal with this in the future. Had räddningstjänstutredningens proposal been in place in the summer so had it gone better, " says Jan-Åke Björklund." "He would not take position as to whether Sweden needs its own släckningsplan." "– the main Thing is that they are available. It can be good, of course, that we as combination with private helicopters and military flights are able to bring in plan from the EU. But it is not my thing to say. " "The four biggest fires according to The Swedish forest agency:"
"Footnote: 1 hectare is 10 000 square metres, or 100x100 metres, a little bigger than a large football field."